With the dust now settled on a busy January window, boss Keith Curle has declared himself ‘very pleased’ with the Cobblers’ transfer business. A week on from a hectic deadline day that saw the late loan captures of Chris Goode and Marvin Sordell, the Town manager has reflected on dealings over the month as a whole in what was his first opportunity to start reshaping the squad. Six players departed, with Kevin van Veen and Matt Crooks being sold for reported six-figure fees, Hakeem Odoffin joining Livingston on a free transfer, Lewis Ward having his loan cancelled, Billy Waters going on loan to Cheltenham and Yaser Kasim having his contract terminated. Five loan signings were brought in, with Sordell and Goode being joined by George Cox, Joe Powell and Timi Elsnik, while in other business, teenagers Jay Williams and Camron McWilliams committed their futures to the club by signing professional contracts. Asked if he is satisfied with what happened during the window, Curle said: “Yes and no. “We missed out on a few targets, but we were part of the domino stack. “We had to wait for certain things to drop before other players were allowed out, and we missed out on a couple because other football clubs didn’t get their targets in. “We had identified the targets we wanted, we had contingency plans if they failed so we could move on to other targets. “Overall the clubs were very good as well and kept us in the picture, so we knew the likelihood of where we were going to be shopping. “Business wise, housekeeping wise, I was very pleased. There has been some discontent among sections of the Cobblers support that no players were signed on permanent contracts. 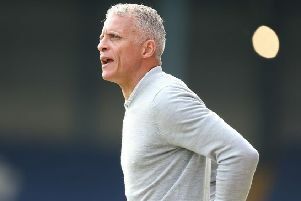 Curle confirmed that bids were made for players, and that he did try and sign players for the ‘medium to long term’, but the deals couldn’t be pushed through, and the Town boss hinted he will be going back for those targets in the summer. “We weren’t able to bring in the permanent transfers, because the ones we wanted to bring in for the medium to long term, didn’t become available in this window,” said the Cobblers boss. The only downside to the window for Curle is that two of his loan signings have suffered injuries. Cox damaged ankle ligaments in the 3-2 defeat at Cambridge United last month, while Sordell is facing at least two weeks on the sidelines as he tries to fully recover from a knee injury. Sordell made his debut in the defeat at Colchester United last Saturday, but he is still not 100 per cent recovered from a knee problem he has had since November. He is expected to be fully fit and available for selection again by the end of February.